Help BandChirps stay active and growing. Minneapolis native Paul Allen studied at the MacPhail School of Music and began his career by singing in local contests, theater productions and weddings. He was working as a shoe clerk when he landed a prime spot on regional radio program The Big Broadcast of 1939 in February of that year. 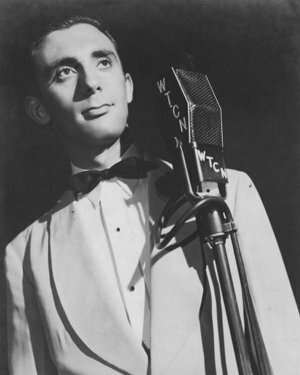 The show, a two-hour variety fest aired over the North Central Broadcasting System throughout the upper Midwest and upper Great Plains, helped to propel Allen’s singing into the spotlight. In February 1940, NCBS signed him to another regional variety program, Radio Vaudeville. Banking on his local success, Allen soon headed to New York, where he worked in nightclubs before being drafted in March 1942. After his discharge in early 1944 he went back to Minneapolis briefly before returning to New York. He joined Frankie Carle’s band mid-year and recorded several popular numbers with the orchestra. He left Carle in March 1946 to get married and start a solo career. All recordings are from the Internet Archive's 78rpm collection. Copyright owners, please see our removal policy. The Online Discographical Project. Accessed 29 Jul. 2015. “Paul Allen's Rise From a Shoe Clerk to Radio Click”, Minneapolis Star Feb. 1939. “Vaduevill to Feature 'Dramer'”, Minneapolis Tribune Feb. 1940. “A Patriotic Undertaking?” Billboard 4 Apr. 1942: 6. “Night Club Reviews: Leon & Eddie's, New York.” Billboard 5 Feb. 1944: 24. “Car Strike Cuts Carle Gross.” Billboard 12 Aug. 1944: 28. “Singer Paul Allen Can Thank Sinatra.” Clipping from unknown Minneapolis newspaper. “Music as Written.” Billboard 6 Apr. 1946: 22. “Marriages.” Billboard 13 Apr. 1946: 85.